Apologies to any of my readers who don't appreciate the importance that a portable game system held in the late '80s. We are at a point in videogame history in which the Gameboy is little more than a piece of 8-bit nostalgia. 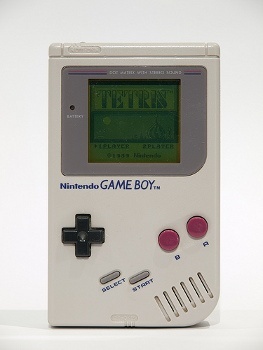 At the time, however, the Gameboy was not just a portable game machine, it was the only portable game machine (with perhaps the exception of the Lynx which boasted a 30 second battery life and a $200 price tag.) Receiving a Gameboy on Christmas morning in 1989 would be like opening your present this year to find a personal teleportation device. Socially, the Gameboy could change your life, you would transform your status from "the pudgy nerd with a girl's name" to hearing things like "Dude, you got a Gameboy? Let's hang out, I know where my dad keeps they key to his liquor cabinet." Of course, convincing my parents that I needed a Gameboy wasn't exactly easy. The handheld wasn't cheap. In my family, getting electronics was even harder thanks to my dad thinking that Satan can enter your body if you sit too close to the television. Mercifully, my mother had a connection to a higher authority, namely Grandpa Cox. He had ultimate jurisdiction in my family, and that meant that I, his only male descendant, generally had his way when it came to gifts. The weeks leading up to Christmas were filled with hints and suggestions to my mother who then relayed the request to Grandpa. When my dad brought in the packages, I already sensed the life-changing present. My father, not one for ceremony, tossed them under the tree with all the grace of a man throwing a particularly smelly sock in the laundry hamper. I saw the gifts land on the floor and knew my dream present was amongst them. My obsession with the gift grew exponentially with each day leading up to Christmas. On the first day, I shook the box to guess at its contents. On the second, I attempted mechanical empathy to see if I could communicate telepathically with whatever was inside. The third day was Christmas Eve, and my anticipation had convinced me to do a bad thing: attempt a stealth operation with epic proportions, most of which I had borrowed from (at least in spirit) the Teenage Mutant Ninja Turtles movie. My plan was to creep into the living room, open one side of the wrapping paper to see if it was really a Gameboy, then replace the wrapping paper, sneak back and pretend to sleep until dad officially declared it Jesus' birthday. Late that night, I slipped ever-so-quietly out of my room and craftily hid behind the tree out of sight of anyone who got up to go to the bathroom. In retrospect, a true ninja of would have probably returned to his room with his booty to perform the unwrapping there. But not being a true ninja master, I had yet to learn the lesson of the creeping mantis. I took the utmost care to preserve the gift-wrapping and make as little noise as I could. This was important; our mobile home carried every sound like an amplifier.